I've never been to Germany for the real Oktoberfest. The little town that we live in has an Oktoberfest celebration this weekend, which is pretty exciting. My husband and I attended last year, and are looking forward to attending again this year. Hooray for beer! For the pretzel cookie, I used a heart cookie cutter and just cut off the tip. Then I took a brown food coloring marker and sketched the pretzel shape on the cookie. I followed the drawing and outlined the pretzel. Then I flooded the cookie. While the icing was still wet, I used real sea salt on the cookie. I felt it would make for a fun salty/sweet combination. For beer mugs, I used two different shapes. One shape was this cookie cutter; the other was this shape for the Silhouette. I started out by drawing the handle portion of the mugs with a food coloring marker. Then I piped and flooded this area with light blue icing and allowed it time to dry. With a brownish yellow icing, I filled in the inner portion of the mug. While still wet, I added a few bubbles to the beer. Once that section dried, I added a light shade of the beer color on top. Then I used ivory icing for the foam portion. I used a darker and light brown on the other two cookies to represent different kinds of beers. 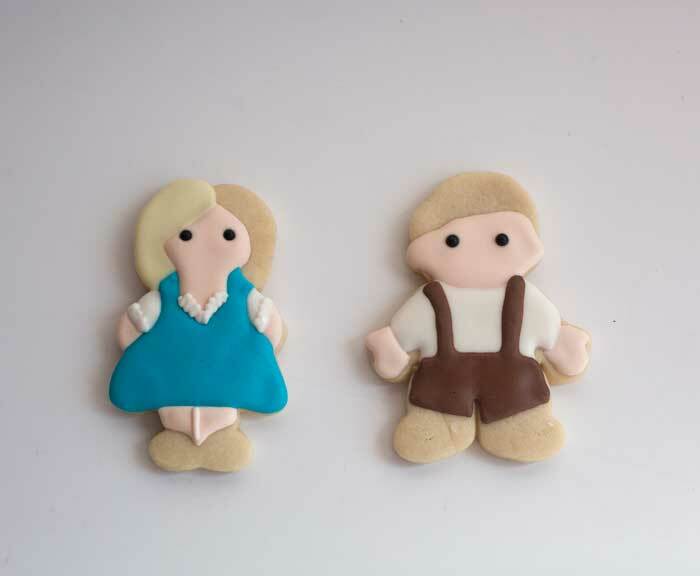 For Mr. and Mrs. Oktoberfest, I used my Wilton's boy and girl cutters. I made a drawing beforehand which helped with placement of everything. I took pictures to better show the steps to decorate these two. For the girl I cut off the pigtail portion before baking. The first thing I did was fill in any flesh tone areas. I used "15-second" icing. While the icing was still wet, I added black dragees decoration balls for eyes. Once the flesh tone icing was dried, I added the blue dress for the girl and the white shirt for the guy. I also added a line with flesh tone piping icing to define the girls legs. The next step was adding white sleeves to the girls dress and some white ruffles to the neck area. I then used a light yellow to fill in the left section of her hair. For the guy I added the brown lederhosen. The next step in the process was to add the apron with white icing. While the icing was still wet, I used pink and green to create a design on the apron. I filled in the right section of hair and added in one black shoe. On the guy, I added the detail to the lederhosen and shirt. I piped a white section to represent socks below the lederhosen. The final touches for the girl were adding the other shoe, a bow at her waist for the apron, and a white "X" just about the apron to represent the lacing on German dresses. I placed a black line across her neck. A lot of pictures I looked at, the women wore a black necklace-like thing. I'm not sure if it has a more formal name. Then I added hair detail and braids. For the guy I added his shoes and some lines on the socks. I put in the chest section on the lederhosen and yellow buttons and buckles. I piped in his hair and mustache. I piped the hat once the hair had dried. The final touches were a line for the hat and a little flower on the lederhosen. If you attend an Oktoberfest celebration, I hope you have a pleasurable and secure time. PROST!